So what's your plan on this Holi?Are you excited about the main festive part of Holi i.e. eating special types of sweets and savouries :-D . I myself is very excited because holi is a festival of joy,colours fun and food.So friends I have made a flavourful snack on this holi which is known as Bhakarwadi. You must have tried this crispy chatapata snack in stores and it tastes so yum.I always use to buy these bhakarwadis from outside shops.But this time i have tried making them at home.And it was far much better from store bought and I always believe that home made food gives you a true pleasure and specially when your family admires your cooking! Bhakarwadi a traditional Marathi cuisine which is sweet and spicy snack popular in Maharashtra.It is made from gram flour and maida dough made in spiral form stuffed with a filling made up of coconut powder,poppy seeds,sesame seeds and with roasted spices. Deep fried bhakarwadi can be stored for around 15 to 20 days in an air tight container. 50 grams desiccated coconut powder. Firstly make a dough by Combining all purpose flour and gram flour by adding red chilli powder,turmeric powder,salt and mix it well. Now start kneading the dough by adding little by little water and make a stiff dough. Cover the dough with a lid and keep the dough for rest for 15 minutes and start preparing the stuffing. Take a wok add Coconut powder,Coriander seeds,sesame seeds poppy seeds and fennel seeds.Roast it for 2 minutes. Take a mixer jar add all these ingredients,now add salt,sugar,red chilli powder and dry mango powder and give a smooth grind to it. Now add this powder in a bowl and keep it aside. 1.Now take the dough and knead it again,divide the dough in two parts and make a round shape big ball of the dough. 2.With the help of a rolling pin make a flat shaped big roti in oval shape or rectangle shape. 3.The shape of the rolled dough should not be very thin nor too thick. 5.With the help of a flat spoon press the stuffing so that it will stick to the flat shaped roti. 6.Here comes the tricky part.Start folding the stuffed oval shaped roti like a log. 7.Do it very gently.Now seal the sides of the rolled dough,so that the stuffing won't come out. 8.With the help of a knife cut the rolled log in equal parts. 9.You will get spiral shaped bhakarwadis. 10.Gently spread each bhakarwadi with the heels of your palms. 11.Repeat this process with the rest of the dough. 12.Heat the oil in a deep wok and fry the pinwheels in batches. 13.Do not fry them at hot flame just keep it on medium flame. 14.When you will find your bhakarwadi has changed its colour and they have turned crispy. 15.Take them out on absorbent paper. 16.Enjoy your Bhakarwadis and Wish you a Very Happy and Safe Holi. Your kids are fussy eaters and you always get worried about their health issues?This is very common now days as children do not want to have a healthy diet specially vegetables. Due to heavy studies and stress,its very important to give your kids a good healthy diet which can give them energy and raise their immune system too. But kids are difficult to handle,as they are interested in junk food which is not at all good for their health,so i have tried making these stir fry vegetables which will act as a power booster and it tastes delicious too. I have added just 2 spoons of oil in these veggies to make it more healthy.The veggies i have chosen is colourful too which makes the dish more attractive and eye catchy to the kids. I have added Bell peppers,corns,broccoli,peas and cottage cheese to add proteins and calcium in your diet. You can also give these veggies as a veggie sandwich by filling these veggies in bread in sandwich maker.You can give this sandwich in your kids lunch box too,they are going to love this. I love to have these stir fry veggies with thin chapatis as franky. Take a wok add 2 tsp oil and heat it up. Add onions and saute it for 2 minutes. Now add all the vegetables except cottage cheese and stir fry it for 4 to 5 minutes. Now check the broccoli and bell pepper that they have turned little soft,if not then cover the wok with a lid for more 2 to 3 minutes. Now add salt and mix it properly. Add cottage cheese,then add garam masala and oregano flakes. Your stir fry veggies are ready to enjoy.You can sprinkle lemon juice on top of it. Enjoy your stir fry veggies. Vada Pav is a vegetarian fast food dish native to the Indian state of Maharashtra.This dish is consists of fried potato dumpling placed inside the bun. 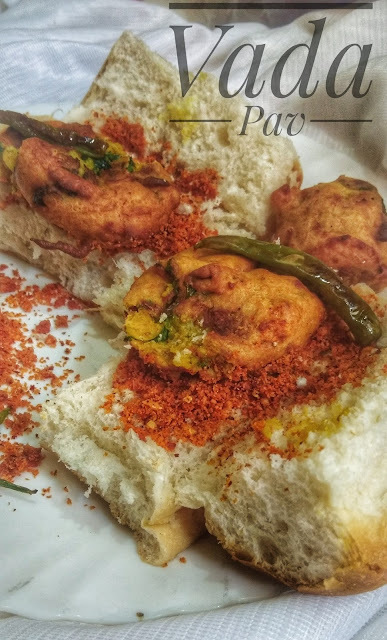 Vada pav is incomplete without it's special dry powdered garlic chutney and fried green chillies. 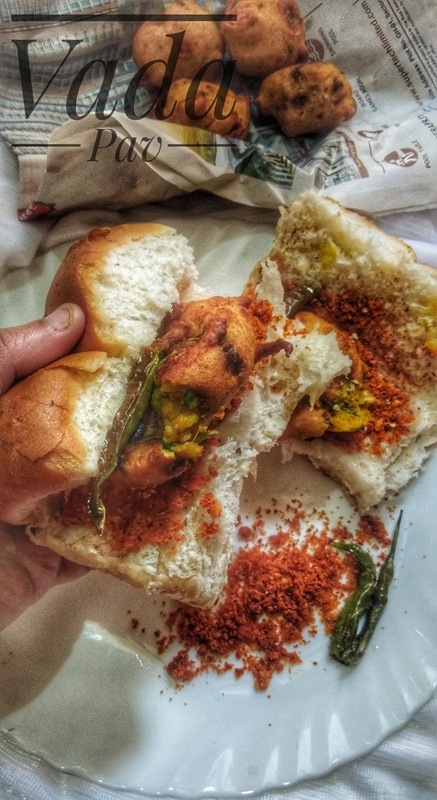 Vada pav known as Bombay Burger is a very popular cheap street food in Mumbai. Vada pav is also known as Batata Vada ,which means potato fritters.The deep fried vada coated with gram flour satisfies your hunger too.You can add these vada pavs in your breakfast or in your evening snack too. 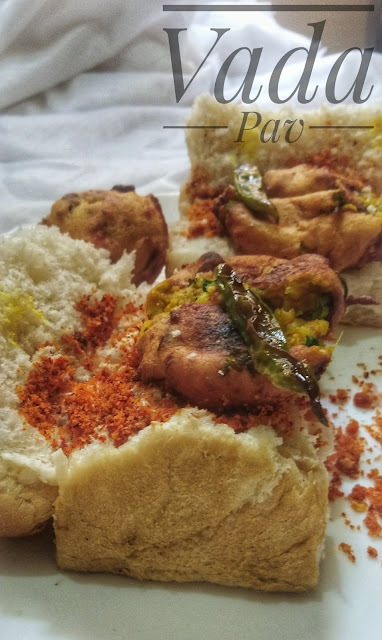 The most favourite part of vada pav is the dry garlic peanut powder.I have made this at home only and believe me its too yum that you can have this with ghee rice also. You can also give this to your children in their evening snacks as kids always demand for some fried food ,so its a good option for your kids. Take a bowl add boiled potatoes and crumble them with your fingers. Now take a wok add 2 tsp oil heat it up. Now add Rai and let it splutter. Add Curry leaves and roast it. Add ginger,chilli,garlic paste and saute it for 1 minute. Then add potatoes and mix it well. Add salt,coriander powder,dry mango powder,turmeric powder and red chilli powder. Mix it very well for 4 to 5 minutes. Add coriander leaves and mix it also. Now take a deep wok add oil and heat it up nicely. Take a bowl add gram flour with some salt and red chilli powder. Mix the dry ingredients and add water in it. The batter should not be thick neither watery. Now take the mixture of potatoes and make small ball and dip it in gram flour. Deep fry them in the oil. Follow the same procedure for the rest of the mixture. Your Vada is ready,Take the pav and cut it in half spread dry chutney from the centre and place your vadas in between. Take a wok add 1 tsp oil add red chillies and garlic fry them for 2 minutes and take them out. Now add peanuts and fry them till they get lightly roasted.Take them out too. Now add coconut powder and roast it till it changes it colour. Now take a mixer jar and add Red chillies,coconut powder,peanuts,salt,mango powder and red chilli powder. Your garlic peanut chutney is ready to enjoy. Yes it sounds interesting Na? I have tried this Creamy Vegetable samosa which is very different in taste.Its filled up with the goodness of vegetables and its really creamy from inside and crispy outside. Take a bowl add apf,semolina and salt and mix it well. Now add oil in it. Mix it really well with your fingers. As you can see a good shaped lump with only dry ingredients and ghee,So if you are able to form this it means that now you can add water and knead the dough. See the dry ingredient lump is shown in the picture. So gradually start adding water and make a normal dough nor too soft neither very hard. Knead the dough for at least 7 to 8 minutes. 5 . Now keep the dough for rest for 15 minutes by covering it with a cloth or plate. Take a wok add 1 tsp oil and heat it up. Now add onions and fry them till they turn translucent in colour. Now add salt in it. Add capsicum,boiled peas ,garlic and peas. Saute it for few minutes till they turn little soft. Now add mango powder,sugar,ketchup and oregano.Mix it well. When your vegetables will turn soft take them out in a bowl. Add mayonnaise and red chilli flakes and mix it with a spoon .keep aside. Heat up the oil in a kadhai. Now with the kneaded dough take a portion and make a small ball from it and divide the dough . Now divide the oval shape in two parts and cut it with the help of a knife. Take a bowl of water and spread some water at the edges and fold the sides on one upon the other to seal the samosa. Now you will get a triangle shape and fill the filling and seal the samosa from the top. Deep fry the samosa on a medium flame for 10 to 12 minutes and flip it time to time. Once they turn golden in colour,place your samosas on an absorbent paper and serve it hot with your favourite dip. Enjoy :-) Happy Cooking ! rainy weather,as we all enjoy these types of munchies like samosa ,pakoras or bhajiyas. These pakodas are made from yellow moong daal lentils and they are mild spicy but does have really beautiful aromatic flavour. These pakodas are crispy from outside and soft from inside.You can enjoy this Moong Daal Ki Pakodi in your breakfast too.In India, Moong daal is commonly used in variety of dishes like Moong daal khichri,halwa or just as a simple Zeera Heeng Wali Moong Daal! This Moong daal is low in fat and rich in B Complex vitamins,calcium and potassium.Its a light daal ,which is free from heaviness and flatulence. So if you are looking for a healthy snacking for your kids or even adults,then you must try out this crispy Moong Daal pakodi. The most easiest and light fried bhajiyas to be enjoyed with Ketchup or dhaniya mirchi chutney is the best combo to relish specially in winters or rainy season. Soak the daal for atleast 3 to 4 hours. After 4 hours drain the excess of water, add the daal in the grinder. Add ginger,green chillies and red chilli powder and make a fine paste .You can add water if required. Now time to add semolina ,coriander leaves and salt in the batter. Mix it well for few minutes. Now take a deep wok add oil and heat it up. Drop spoonful of batter in the hot oil. Fry it first on high flame and later on a medium flame,till they turn out crispy and golden in colour. 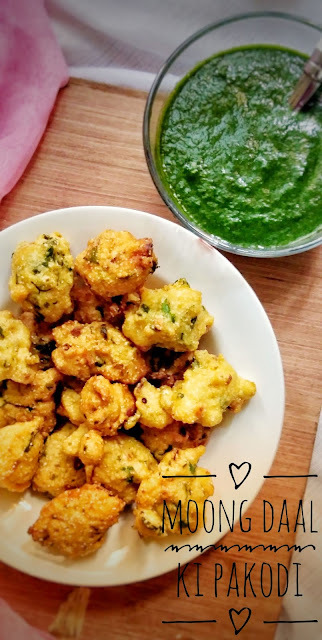 Place your pakodis on an absorbent paper and enjoy them with your freshly made chutney or ketchup. This bread is made from eggs but i have made it egg less means a pure veg bread which has risen up so well and it tastes heaven! 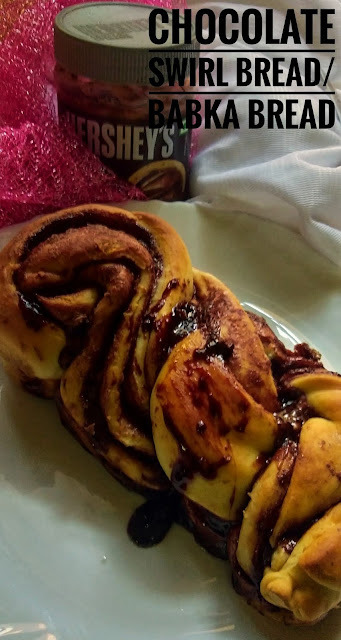 This is my first try on baking a sweet bread ,though i have tried many savoury breads and it tastes amazing ,but this bread is now in one of my favourites list because i love eating sweet dishes.This bread is not too sweet ,as the bread is balancing the taste of chocolate.I have used @Hershey's Choco Spread but you can use any chocolate its up to you. Take a small bowl and add yeast and sugar in it mix it with a spoon. Now add warm milk and mix it well. Cover the bowl with a lid and keep it aside for at least 15 minutes or till your yeast mix turns frothy and bubbly. Now take a Big bowl and add All Purpose flour. Add soft butter and mix it well with your fingers. Now add your yeast concoction gradually in the dry flour. Do not put all the wet yeast concoction. Add slowly and start kneading the dough. The dough should not be very soft neither too hard. Punch and stretch the dough for about 5 minutes. After 1 hour knead and punch the dough again and spread some dry flour on your kitchen slab. Take a roller pin and start rolling the dough in a rectangular shape about 1 cm thick or 1/3 of an inch. Now spread your chocolate spread and roll up from the long side of the rectangle. After this step cut through the centre of the roll and twist each side over the other. Bring the two ends of the twisted bread together and seal the ends. Now take a bread tin and grease it with some butter. Pre-Heat the oven at 200 degrees for 10 minutes. Now keep your tin in the oven and bake it at 200 degrees for 30 minutes. After 30 minutes take the tin out and give a milk wash to your bread by applying little milk with a brush on the bread and again keep it in the oven for more 10 minutes. After 10 minutes take the tin out and let the bread cool down. Take out your Babka Bread and enjoy. Winters are incomplete without soup.Soup gives a warmth feeling in chilling cold.Sometimes we get bored of having the same healthy soup like spinach , tomato and the basic corn soup :-( So to have some chatpata on your taste buds do try this spicy and tangy Manchow Soup. This soup is healthy too because it contains veggies and your children would love eating these veggies in hot soup. The aroma of garlic and ginger adds a yum aromatic flavour to the soup and this soup will give a warmth to your body.Ginger and garlic both acts a medicine because they help us to fight cough and cold which we get very frequently in winters. Manchow soup is incomplete with Chow :-D yes chow means chowmein .I have added some fried hakka noodles to get a crunch in your mouth. Normally we enjoy this soup in restaurants but i have tried this at home and believe me my family members were saying that this soup is far much better than the outside soup.Yes this soup takes little efforts and time to make but the result you will get after relishing this crunchy soup,you will find it worth while making it. Take a pan add water. Now cover the pan with a lid and boil it on slow flame till 20 minutes. 1.Now take a kadhai add oil for deep frying the noodles. 3.Take the noodles and coat them with dry cornflour powder. 4.Fry the noodles in batches. 5.Fry till they turn golden in colour and keep them on an absorbent paper. Now after 20 minutes strain the veggies and keep its water in a bowl.Your fresh stock is ready. Take a wok add oil and add garlic and ginger. Add onions and stir it well. Add green chillies also and mix it well. Fry it for few minutes till it starts changing its colour. Now add baby corns,cabbage,carrots and add salt and sugar in it. Add 1 cup stock in it. Now go for a good boil. Take a cup add cornflour powder and water in it.Mix it well. Add this mix in the soup. Give a good stir to avoid lumps. Now add the rest of the stock.You can add more water if needed. Again go for a boil and add white vinegar in the soup. Lastly add some freshly chopped coriander leaves. Your hot and sour Manchow Soup is ready. Serve it with crispy fried hakka noodles separately.